Calling all farmers for the fifth Agritech Expo Zambia in Chisamba in April! “Agritech Expo Zambia has been embraced by the farming community and every year we look forward to bringing new features, new technologies, more country pavilions and more free training and knowledge sharing to add value to each and every farmer’s operation” says Emmanuelle Nicholls, event director of Agritech Expo Zambia which returns to Chisamba from 12-14 April this year for the fifth time. This year the event at GART is expected to bring more than 22 000 visitors, over 270 local and international exhibitors with 3500 VIP and large scale farmers and 150 members of the media. Agritech Expo Zambia is free to attend for all visitors that pre-register. The international interest in the three-day expo is also growing with more and more foreign companies looking to invest and find business partners in Zambia. So far the country pavilions from France, Germany, Zimbabwe, Czech Republic and Finland have already been confirmed. The success story that is Agritech Expo Zambia is a great source of pride for the Zambia National Farmers Union, the owners of the event. Last year the event featured seven international pavilions and a VIP attendance that included five cabinet ministers and the Zambian President Edgar Lungu who visited the event for the third year in a row. Machinery demonstrations - an exciting attraction at Agritech Expo Zambia and a great display of versatility and capability by leading machinery suppliers. Construction park - offers visitors a selection of quality construction equipment to suit their agricultural needs. 4x4 test track - gives visitors the opportunity to test their skills or simply be driven around the track and experience the capability and manoeuvrability of high-end utility vehicles. Crop trials – visitors are able to view the yields of seeds from a variety of seed producers and respective agro chemicals companies. Energy park - introduced in 2016 and offers innovative ways to get off the grid amidst the power crisis unfolding in the region. 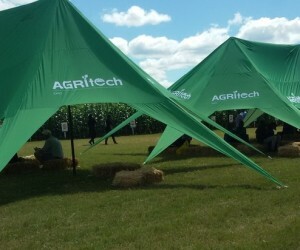 International pavilions - Agritech has become an internationally acclaimed event, boasting over 39 countries being represented onsite year on year. 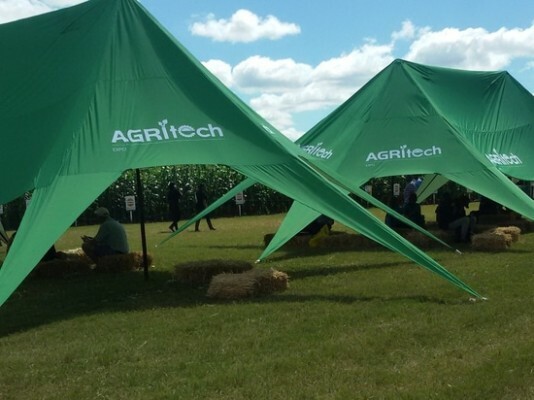 In 2018, Agritech Expo expects to feature over 10 international country pavilions featuring products and solutions from global industry leaders. Indoor expo - showcases a variety of local and international agri suppliers looking to expand their footprint in sub-Saharan Africa. Irrigation zone - displays a variety of irrigation systems and farming solutions, including centre pivot displays for commercial and small-scale farmers from leading industry suppliers. Livestock zone - incorporates various breeders who display their livestock services, species of livestock including goats, cows and sheep, as well as animal feeds and veterinary services. Centre pivot display - Agritech Expo Zambia is the first agri focused event in Africa to showcase a live centre pivot as part of the show. AgriTeach workshops - this year the AgriTeach interactive training workshops are launched, presented by industry experts and focused on modernising small-scale farmers. AgriTeach provides access to market information, practical demonstrations and innovations from the latest financial loan models to new agri solutions. Large scale farmers seminars - focusing on innovative solutions and initiatives to increase productivity under challenging market conditions. SME zone - a cost-effective designed area for local based companies to participate in the event and to engage with farming professionals, without having to create a large display area. VIP Business Lounge - specifically geared for VIP farmers, government officials, policy makers and media officials to network and conduct meetings, directly with suppliers to the market and vendor companies. Mowing and baling demonstrations - for the first time, Agritech Expo 2018 will be showcasing live mowing demonstrations. This new demo area is focusing on quality mechanisation for mowing purposes and will give farming professionals the opportunity to view this equipment in action. Aquaculture showcase - Aquaculture is a growing market in sub-Saharan Africa and Agritech Expo 2018, will be showcasing the regions’ most prominent players in this field. Live planting demos - providing the opportunity for companies to practically demonstrate how products work. Greenhouse showcase - a first-hand opportunity to see the effects and benefits of using a variety of seeds with fertilisers and pesticides to maximize yields. Value added zone - boosting commercial opportunities for farming operations by featuring the latest industry trends and solutions on ways to improve quality and enhance yields. As in previous years, Agritech Expo enjoys extensive support from the agri industry with well-known suppliers AFGRI and John Deere returning as platinum sponsors once again. Confirmed gold sponsors are Gourock, SARO and Ursus. Agritech Expo Zambia has just won its third AAXO ROAR award for Best Africa Bound Trade & Consumer Exhibition in the 12000+ sqm category at the AAXO ROAR Organiser and Exhibitor Awards in Johannesburg which honour excellence in the exhibition and events industry on the continent. Last year the event also won for Best Trade & Consumer Exhibition 12000+ sqm and for Distinction in Social Responsibility.